Walking through Caesars in Las Vegas may seem like a dreamâ€”the lights are not too bright, the temperature is perfect, and everything is within your reach. But behind this â€œmagicalâ€ experience is a carefully choreographed performance based on deep understanding and rigorous analysis of extensive data to help ensure guests have an incredible and personalized experience. 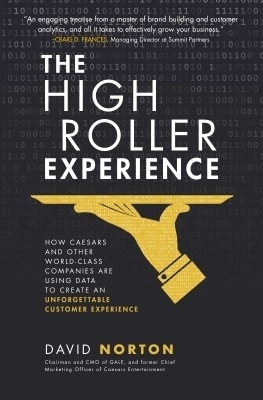 The Caesars marketing story is recognized as one of the best examples of using data to improve the customer experience and marketing effectiveness in all of business. Marketing legend David Norton orchestrated the initiatives that made Harrahâ€™s/Caesars Entertainment one of the greatest marketing companies in the world. His approach of using data to identify opportunities for the business, developing the narrative to sell throughout the organization and partnering with various constituents to drive successful implementation operationally is unparalleled. In The High Roller Experience, he shares his secrets to creating an unbeatable marketing strategy. In addition to discussing core items such as analytics, CRM and loyalty programs, he examines the leadership and organizational processes required to create a customer-centric and data informed business. The author also shares case studies from the work at GALE helping companies leverage technology advances to improve the customer experience and build customer loyalty across a wide-range of industries. With this book to guide you, youâ€™ll learn how to use loyalty programs, analytics, and technology to drive phenomenal transformational change and rapid revenue growth within your own organization.